Ayelet Brachfeld. Photo credit: Messarvot. Ayelet Brachfeld refused to be conscripted into compulsory Israeli military service due to her opposition to the occupation of the Palestinian territories. The Israeli military released from prison on Tuesday, July 3, 2018, occupation objector Ayelet Brachfeld after incarcerating her for four prison terms totaling 100 days. Brachfeld refused to be conscripted into compulsory military service due to her opposition to the occupation of the Palestinian territories. With her release the army’s conscientious objection committee granted Brachfeld an exemption from military service based on her claim of refusing conscription for reasons of conscience. This is in contrast to most other objectors to the occupation who have been imprisoned and who are ultimately excused from service for “serious misconduct,” “unsuitability,” or who are given psychological exemptions. 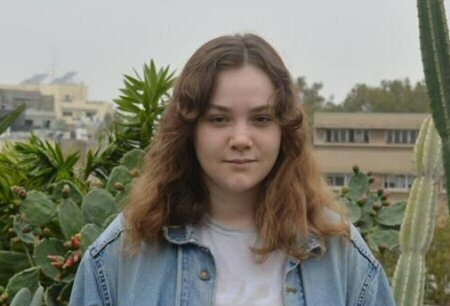 Brachfeld is one of more than 100 Israeli high school students who signed the 2017 letter signed by shministim (last semester high school students), and who has been supported during her struggle by Messarvot — Refusing to Serve the Occupation, a grassroots network that brings together individuals and groups who refuse to be conscripted into the army in protest to the occupation. Two additional conscientious objectors, Hillel Grami and Lohar Altman, are expected to declare their refusal to serve in the military in the coming weeks. This article was originally published by Maki, a faction of the communist party Hadash, and edited for aicnews.org.